To enable the identification and awareness of situations and risky behaviours related to alcohol abuse especially in the target audience (18-25 year olds). To communicate that it's best to control drinking in a fun way for a good night. 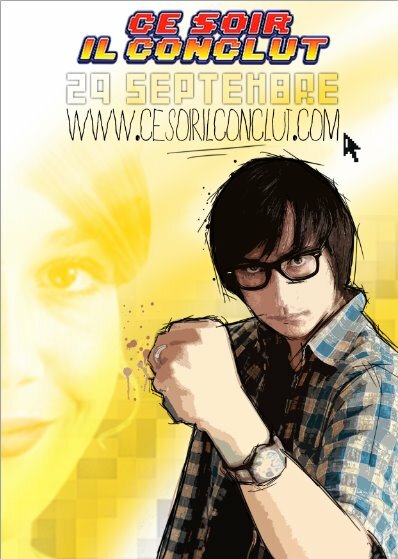 Launched on 29 September 2011, the serious game combines the web-series and arcade game styles and builds on the highly popular "Make your mind up Clement" video series. 100 mini-video footages were written, shot and assembled corresponding to the different possible combinations of actions / reactions that depend directly upon the amount of alcohol drunk by Clement. The main characters: There are 4 main characters. Clement, the geeky hero and university student, and his brother Swann. Chloé the cool girl and Serena the ex-girlfriend. The Game: The game starts when Clement receives an ultimatum by his brother to score with Chloe and the player is designated his coach in order to help. The game mirrors a classic evening with friends and features three environments: "before", "club" and "after". In order to keep player's attention the characters talk and act in a typical way setting an intentionally humorous, offbeat and non-judgemental tone. Four 2D arcade games are integrated into the main game which are influenced by the levels in the main game. Different levels include different speeds, Gaussian blur and field of vision to reproduce the physiological effects of alcohol consumption. 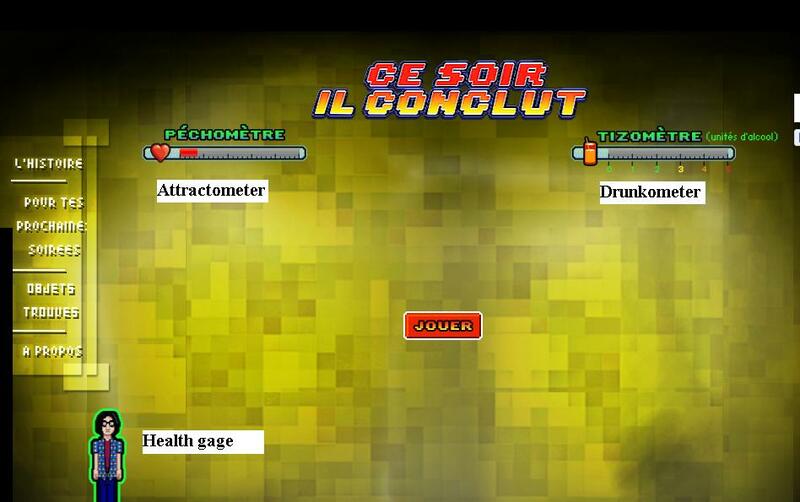 Scoring and playing: Users have to help Clement by raising his attractiveness rating (attractometer) which decreases in proportion to the number of drinks he's had (drunkometer). The higher the drunkometer – the more difficult it is to please Chole! The drunkometer rises with each drink. 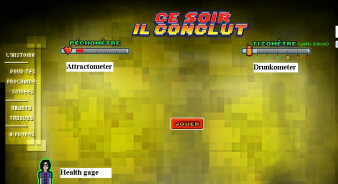 It shows "warning" messages at certain levels (simple and clear consumption benchmarks as recommended public health organizations) along with precise information on the physiological effects and risks associated with alcohol consumption in relation to the number of units consumed, allowing the player to refine their strategy and learn. The attractometer's level changes according to the amount of alcohol drank and shows information on units of alcohol and the equivalence of alcoholic drinks when the mouse glides over it. The health indicator shows the effects of alcohol based on the number of units consumed and the possible consequences on the body and behaviour. Game ending: If the attractometer reaches 100% a "happy ending" video plays. If however it drops to zero or if the the drunkometer rises too high (5 units consumed) a "game over" video plays and the user is invited to play again. A "game over video" also plays when a situation would be dangerous in real life (allowing the player to be aware of risks and possible consequences of their behaviour). For example, after the club, Clement must test his blood alcohol level using a breathalyser and then choose how he gets to the after club venue. If he chooses to drive, while above the legal limit, a game over video plays. More information on responsible drinking can be found on the site's "For your next evening" page which contains information on topics such as lower risk consumption thresholds, risks of drink-driving, the risks of excessive consumption. It also provides advice on how to organize an evening in a responsible way. In order to stir up curiosity in potential players teaser content was posted onto the webpage every day for 10 days before the launch and targeted advertising took place on relevant sites like Dailymotion, blogs addressing the themes of the game, student blogs etc. The game also has Facebook and Twitter accounts. Ninth Pole Media (Start up/production company and creator of "Make your Mind up Clement!"). Interaction Healthcare (specialist in interactive health entertainment). The game was played over 100,000 times. The ad on dailymotion was seen over 420,000 times. The various videos on youtube (short and long clips, mental preparation and move yourself) were seen over 29,000 times. The Facebook had almost 10,000 "likes". The game was played by a mixed population: 56% men and 44% women. The fact that the main character is a man has not stopped women from playing. 87% of respondents found the game "Very well designed and very interesting" or "well-designed and interesting." The adjectives used the most to describe the serious game were: Fun (28%), Original (27%) and Cool (26%). 2/3 of respondents were able to play the entire game and so saw the prevention messages throughout the game. 93% of respondents would advise their friends to play the game. After playing the game, respondents felt "more alert to situations and risky behaviour" (32%), "better able to manage their consumption in the evening" (30%) and "better informed about the effects of alcohol consumption "(21%). Only 4% of respondents believed that low-risk drinking guidelines were above 4 units. Below this threshold, opinions were divided: 37% cite two units of alcohol, corresponding to the legal limit for driving.